Little Pines Apartments is a small apartment community that features 1-bedroom apartments in a quiet location conveniently located near the northeastern edge University of Florida in Gainesville, Florida. 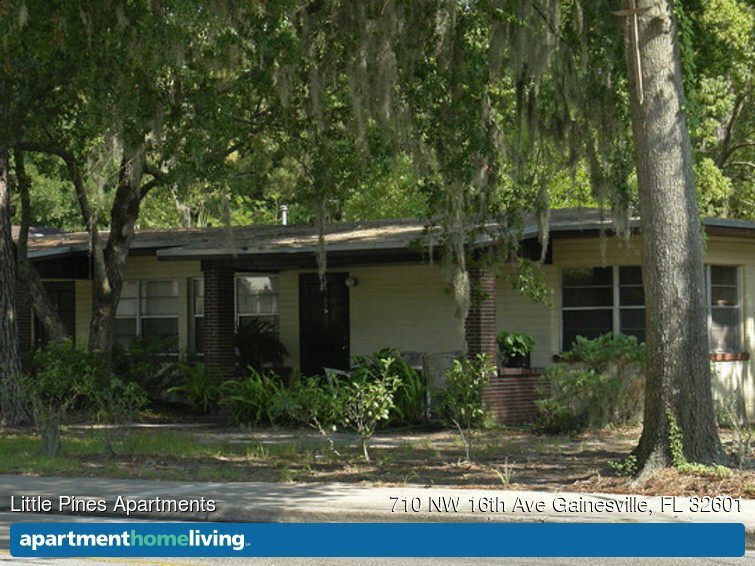 Individuals looking for a quiet place to live near the University of Florida campus will love Little Pines Apartments in Gainesville, Florida. While there are public transportation options near the community, residents with a car will find their access to campus via car much easier. Students can get to their classes at Matherly Hall in just a 6-minute drive, or they can ride the 8 bus and get there in under 30 minutes. For those who enjoy seeing the Gators in action, they can drive to the Ben Hill Griffin Stadium in 8 minutes. They can also access the big game by taking the 122 bus for thirty minutes. When residents desire live entertainment, they can drive 8 minutes or take the 10 bus for 30 minutes to reach the University Auditorium. Serious shoppers find plenty of retail options near them when they live in the community. Little Pines Apartments is located just a 3-minute drive from Gainesville Plaza which is home to a number of stores. Residents can find a new look at Ross Dress for Less or Burlington Coat Factory. For those residents who have pets, they can treat their furry friends to new toys and treats from the Pet Supermarket. Gamers will also be able to bring home the latest game releases with a Gamestop tucked away in Gainesville Plaza as well. No matter an individual’s shopping preferences, they are sure to find a store that pleases them. Residents of Little Pines Apartments have a number of restaurants within walking distance of their homes. An 8-minute walk will get them to Civilization, an employee-owned co-op eatery that serves wholesome options and is highly-rated. Those in need of a quicker, casual dining options will be glad to have a Burger King and Little Caesar’s Pizza in the same area. The Northeast Park is also right around the corner for those residents who need some time outdoors. Residents can walk the trails, play baseball, play racquetball or let the dog off the leash at the park’s dog park. Northeast Park is just a 15-minute walk or a 4-minute drive from Little Pines Apartments. With a location that is convenient to campus, yet is far enough away from campus to be peaceful, students looking for a new home will find a lot to enjoy at Little Pines Apartments.